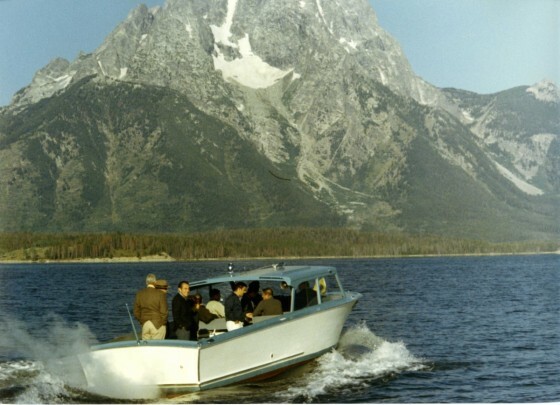 President Nixon and others boating on Jackson Lake at the Grand Tetons National Park near Moran, Wyoming. On this day in 1970, President Nixon relayed a comprehensive message to the Congress of the United States regarding the proposed reorganization plans to establish an Environmental Protection Agency and the National Oceanic and Atmospheric Administration. Click here to read President Nixon’s entire message to Congress. As part of President Nixon’s overarching efforts to reorganize the Executive Office of the Presidency, Reorganization Plan #3 sought to consolidate the federal government’s environmental resources so as to create an organization capable of concisely combating the nation’s environmental issues. Additionally, Reorganization Plan #4 sought to consolidate the federal government’s research efforts in the field of oceanic resource management–to create a singular agency with the task of developing the most intelligent use of marine resources. With the public’s awareness for the environment at a never before seen pinnacle and air and water pollution at deplorable levels, change needed to be instituted to make possible a coordinated attack. –The functions carried out by the Federal Water Quality Administration (from the Department of the Interior). –Functions with respect to pesticides studies now vested in the Department of the Interior. –The functions carried out by the National Air Pollution Control Administration (from the Department of Health, Education, and Welfare). –The functions carried out by the Bureau of Solid Waste Management and the Bureau of Water Hygiene, and portions of the reactions carried out by the Bureau of Radiological Health of the Environmental Control Administration (from the Department of Health, Education and Welfare). –Certain functions with respect to pesticides carried out by the Food and Drug Administration (from the Department of Health, Education and Welfare). –Authority to perform studies relating to ecological systems now vested in the Council on Environmental Quality. –Certain functions respecting radiation criteria and standards now vested in the Atomic Energy Commission and the Federal Radiation Council. –Functions respecting pesticides registration and related activities now carried out by the Agricultural Research Service (from the Department of Agriculture). –The Environmental Science Services Administration (from within the Department of Commerce). –Elements of the Bureau of Commercial Fisheries (from the Department of the Interior). –The marine sport fish program of the Bureau of Sport Fisheries and Wildlife (from the Department of the Interior). –The Marine Minerals Technology Center of the Bureau of Mines (from the Department of the Interior). –The Office of Sea Grant Programs (from the National Science Foundation). –Elements of the United States Lake Survey (from the Department of the Army). –The National Oceanographic Data Center (from the Department of the Navy). –The National Oceanographic Instrumentation Center (from the Department of the Navy). –The National Data Buoy Project (from the Department of Transportation). –The Weather Bureau (weather, marine, river and flood forecasting and warning). –The Coast and Geodetic Survey (earth and marine description, mapping and charting). –The Environmental Data Service (storage and retrieval of environmental data). –The National Environmental Satellite Center (observation of the global environment from earth-orbiting satellites). –The ESSA Research Laboratories (research on physical environmental problems).